Each year in February, the Londonderry Conservation Commission and Londonderry Trailways host the Musquash Field Day. The event is generally held the second Saturday of the month and is a great opportunity to see the 1,000 acre conservation land right here in town. The day normally begins at 10 AM, when participants meet at the entrance to the Musquash on Hickory Hill Drive. Those interested will be led on a guided hike along the trails, enjoying winter wildlife, botany and cellar holes. At the end of the hike, all are welcomed to gather around an open fire for free hot cocoa, hot dogs and marshmallows. The hike will end at 2 PM. Children, pets, and adults of all ages are welcome to join in this event, so bundle up the kids for a different sort of winter activity. 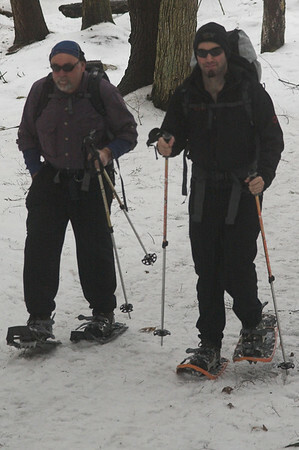 Eastern Mountain Sports of Manchester will be onsite providing snowshoes if there is enough snow on the ground. Participants are also welcome to bring their own snowshoes, or just a good pair of warm winter boots. The event is held annually, snow or shine. Parking is located at the end Hickory Hill Drive. Click here for more information about the Musquash Conservation Area.